"Advertisers have long been in the business of tapping into our national celebrations and anxieties"
"What is a nation?" the bigoted Citizen barks at Leopold Bloom in Ulysses. "A nation," Bloom replies, "is the same people living in the same place." James Joyce supplied this succinct answer to the thorny question of nationhood almost a century ago, but in the 21st century the matter remains very much up for debate. Technological and political developments have led to an increasingly globalised world. The internet, modern society’s chief source of entertainment and information, is largely borderless, allowing us to access content and interact with others from all over the world. Borders and governments may still maintain a relatively clear sense of what constitutes a distinct nation in political terms, but, in cultural terms, globalisation has rendered the sense of what constitutes a distinct national identity a lot murkier. The resurgence of nationalist politics, as evidenced by the likes of Donald Trump, Jair Bolsonaro and the Alternative für Deutschland party among others, has arguably been as influenced by anxieties over national identity as it has been the economic chaos of the last decade. Ireland has largely been spared from the chest-thumping nationalist politics that has divided other nations in recent years, but it would be foolish to suppose that we are somehow uniquely comfortable in our own sense of national identity. Any famous guest to our shores (and/or the couch of The Late, Late Show) is fervently quizzed as to their impressions of Ireland in the hope that they’ll affirm our distinctive culture. Irish internet content is rife with tongue-in-cheek articles celebrating the minutiae of everyday Irish life, from local junk food brands to public transport hijinks to memorable moments from the Late, Late Toy Show (the only programme which regularly attracts more viewers than major sports events). And then, of course, there’s sport. Sport and national identity have been intertwined throughout history, a fact not lost on Joyce who modelled the aggressively patriotic Citizen on GAA founder Michael Cusack. Cusack and his peers founded the organisation with a view to fostering an Irish culture that was distinct from its British coloniser, and almost a century after independence it continues to serve this function. Again, think of how many visiting dignitaries are taken to Croke Park as a matter of course. Since 2015, over half of the 20 most watched Irish television events each year have been sporting events. We turn to sport to provide us with a rare sense of national community, a feeling that we are all sharing the same experience and rooting for the same team. All of this makes sport highly valuable to advertisers and sponsors seeking to imbue their brand with a sense of meaning and significance. As a totem for national identity, sport is less divisive than nationalist political rhetoric and more significant than the cultural ephemera ironically celebrated online. Moments like Robbie Brady’s goal against Italy or the historic win over the All-Blacks give us the feeling that not only is Irishness tangible, but also something to be proud of, something that can compete and thrive on an international stage. Advertisers have long been in the business of tapping into our national celebrations and anxieties. As former Harvard and Oxford professor of marketing Douglas Holt put it, "iconic brands perform national identity myths that resolve cultural contradictions." My own research explores the cultural power and commercial value of sport by examining a brief but interesting period in which mobile services provider, Three, were the primary sponsors of both the Republic of Ireland international football team and the Ireland international rugby union team. Their 2013 sponsorship campaign, celebrating the fans of the football team as "the best in the world", saw SIM sales rise by 214 percent that year. In 2015, the year they produced their first campaign for the rugby team, they triumphed at the Irish Sponsorship Awards. 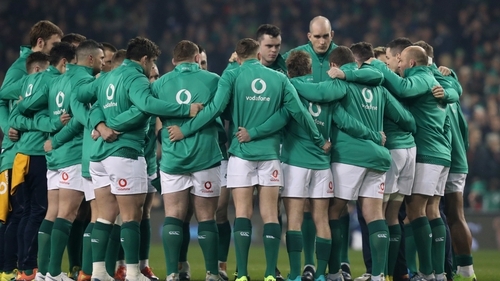 Vodafone have since become sponsors of the Ireland rugby team and the reputedly eye-watering sum they paid for that position attests to the value of sport sponsorship in Ireland. For the brand, this value comes from the ability to associate the sponsor brand with the most tangible and most positive qualities of Irishness. For the audience, it comes from the brand’s ability to shape the chaotic and irregular moments of sporting national triumph into a readily digestible narrative that we can dine on while we wait for the next brief and brilliant moment on the pitch. In Ireland, as in many other places, our sense of national identity is keenly felt, yet hard to pin down. Culture is a funny thing – the bigger it is, the harder it is to find. It is easy to pinpoint the shared rituals and tastes that make a village a community rather than merely a group of individuals living in close proximity, but what about a whole country? Beyond the cold, dull facts of sharing the same kind of passport and government, what joins the plumber in Dublin with the farmer in Donegal or the 80 year old woman in Cork with the teenage boy in Cavan? It is unlikely they listen to the same music, read the same books or attend the same events. Is Ireland no more than "the same people living in the same place?" It is in those moments where those same people come together to cheer on the boys (or girls) in green that it feels much more than that. We may count ourselves lucky that Irish sport offers an outlet for national identity that has not been co-opted by xenophobic politics, but we should certainly keep a keen eye on how sponsor brands and advertisers make use of it. The Irishness we’re sold may seem like it’s the only kind on offer in a globalised world, but it may not always be worth it.